Buckwheat groats, also known as kasha or just simply groats, are a cereal grain with origins in central Asia. They have a nutty flavor and soft texture, and cook in less than 15 minutes. If you're looking for a healthy side dish to accompany meals, consider buckwheat groats. 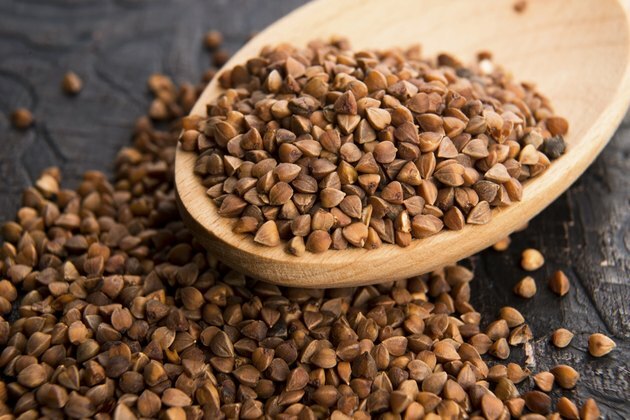 Raw buckwheat groats are a good source of fiber, protein and iron. The calorie content of raw buckwheat groats does not differ much from other grains. A 1/4-cup of dry raw groats contains 140 calories, versus 140 to 160 calories in the same serving of dry rice or barley. As a cereal grain, most of the calories in raw buckwheat groats comes from its carbohydrate content. A 1/4-cup serving of dry groats contains 32 g of carbohydrates and 5 g of fiber. Raw buckwheat groats are a better source of fiber than brown rice, which contains 1 to 2 g of fiber per 1/4 cup dry serving. The fiber in the buckwheat groats takes longer for your body to digest, aiding in hunger control. Fiber also helps prevent constipation, and lowers blood cholesterol levels. Raw buckwheat groats also provides some protein and fat. A 1/4 cup serving contains 1.5 g of total fat and 6 g of protein. While fat is often blamed for causing weight gain, it is an essential nutrient and should provide 20 to 35 percent of your daily calorie intake. Fat is needed for growth and development, energy and vitamin absorption. The protein in raw buckwheat groats does not provide all of the essential amino acids, and is an incomplete source of protein. If you eat other grains and vegetables throughout the day, you can adequately meet all of your essential amino acids needs. Protein should provide 10 to 35 percent of your daily calorie intake. A 1/4-cup serving of dry groats meets 6 percent of your daily value of iron, or about 1.08 mg. The percent daily value acts as a reference guide for nutritional quality of food, and is based on a 2,000-calorie diet for healthy adults. Iron is an essential nutrient that helps transport oxygen throughout your body. It is the most common nutritional deficiency in the world, according to the Office of Dietary Supplements. Although groats are not a significant source of iron, including it in your diet can help you meet your daily needs. What Are the Benefits of Whole Grain Pasta?